The avalanche danger is rated CONSIDERABLE due to a thin layer of weak snow 2-3' below the surface. Triggering a slab avalanche breaking in this layer and taking out the top few feet of snow will be likely on slopes steeper than 35 degrees at elevations above 1,000'. These slab avalanches can be triggered remotely (from the side, above or below) as well as propagate across entire bowls. Cornice falls are also a concern and will have the potential to trigger a large slab below. If the sun comes out, solar radiation may trigger wet loose sluffs as well as increase the likelihood for triggering a large slab. Below 1,000' the danger is LOW due to snowpack composed of hard crusts. **The avalanche conditions we are dealing with this President's Day Weekend can be unsurvivable and call for cautious route-finding and conservative decision making. These avalanches can release when there are no red flags present and several tracks are already on a slope. Summit Lake: An unstable snowpack persists in the Summit Lake area, make sure and check the Saturday Summary HERE. Recent heavy precipitation, strong winds and warm temperatures have created dangerous avalanche conditions in the Southern Kenai; this includes the Seward zone (Lost Lake/Carter/Snug Harbor/etc). Cautious route-finding is recommended. Other regions throughout Southcentral, AK including Chugach State Park and Hatcher Pass have heightened avalanche conditions. There were two skier triggered avalanches on the same slope in the South Fork of Eagle River yesterday, please take a minute to read the report HERE if you are thinking of heading to these areas this President's Day Weekend. Also, don't forget to check the Hatcher Pass Avalanche Center's Saturday morning forecast! 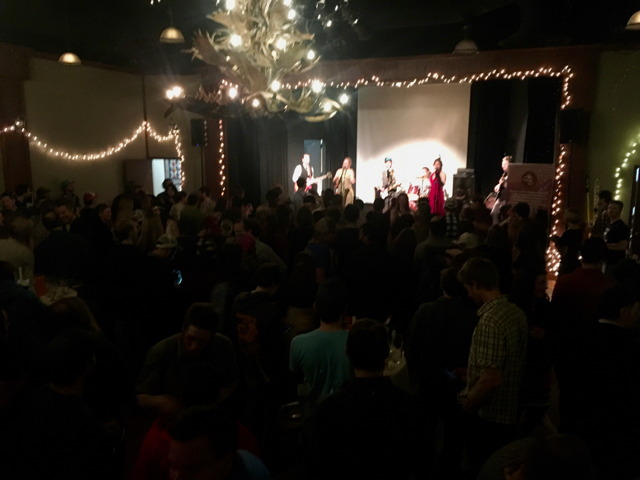 A big THANK YOU to everyone who attended our 3rd Annual Snowball last night to support the Friends of the CNFAIC and the Alaska Avalanche School!! Hats off to Sassafras for getting the SOLD OUT crowd's heels up on the dance floor!! With a long weekend beginning today and many folks looking forward to enjoying the high quality snow from last week's Valentine's Day Storm, it may be easy to forget there is a bad layer of snow just 2-3' below the surface. This is a thin layer of buried surface hoar and near surface facets (seen in the video and photo below) that sit under the 2-3+' of snow from last week. Observations from yesterday continue to confirm that the layer is very reactive and triggering a slab avalanche on the steeper slopes is likely. On Wednesday, there were several remotely triggered slabs on this layer in the Girdwood Valley. At Turnagain Pass, very few folks have been out to test the slopes. Visibility should be good enough today, and this weekend, for travel to the upper elevations. If this is the case, remember the snowpack is unstable. This could be a tricky situation since the pack may 'seem like it feels fine' and people could get away with riding/skiing steeper terrain before a slope breaks. Slopes that saw higher traffic last weekend could remain intact while an adjacent slope slides. This is the kind of avalanche that could have several tracks on the slope before someone finds the right trigger point (thin areas of the slab). What can we do? Terrain management is the key for hedging our bets. This is simply sticking to lower angle slopes, under 35 degrees with nothing steeper above you. If you did not see this video yesterday, take a look today. If the sun shines and winds are calm, solar radiation can be significant this time of year. Wet/damp loose sluffs on steep South aspects are likely when we do get this first shot of warmth. Additionally, the warming surface snow can enhance the likelihood of triggering a slab. Avoiding sun baked slopes this weekend will be recommended. These Southerly aspects likely have a crust under the new storm snow with either buried surface hoar or near surface facets on top - creating a perfect slab/weak layer/bed surface set up. Cornices have grown and changed shape following the Valentine's Storm. These could be teetering on the balance and could break further back than expected. If one does fall it is likely to trigger a slab avalanche below, potentially creating a very dangerous situation if a person is involved. If the sun comes out today, or this weekend, warming can loosen these beasts and increase the potential for them to break. Lurking at the bottom of the snowpack are various layers of facets with varying degrees of strength. In the Summit Lake zone and some areas in Girdwood Valley and Johnson Pass depth hoar has been found. Last week's storm cycle tested these layers and only a few avalanches, that we know of, broke in the deeper layers (Girdwood Valley, Portage Valley and Summit Lake). These layers will be tough for people to trigger, but possible in shallow snowpack zones. More likely is the case where an avalanche occurring in the upper layers of the pack will have the potential to step down and release the entire snowpack. If this does happen the volume will be large and could run long distances. The possibility of these large avalanches is another reason for conservative terrain choices. Mostly cloudy skies with an afternoon snow shower added 1-2" of new snow to most areas in the Girdwood Valley, Turnagain Pass and Summit Lake yesterday. Ridgetop winds have continued to steadily decrease since the mid-week storm. During the past 24-hours averages have been in the 5-20mph range with gusts in the 30's from the East. Temperatures have dropped slightly as well with sea level temps finally in the mid 20'sF this morning, 1,000' is still in the upper 20'sF and ridgetops are in the upper teens. For today, instability showers will again be over the region. This means, areas with clearing skies and areas with a snow flurry or two. Only a trace of accumulation is expected. Ridgetops winds will be light to moderate today from the South and East, averages in the 5-15mph range. Temperatures will be near 30F in the parking lots at 1,000' and in the low 20'sF at the upper elevations. Looking ahead to Sunday and President's Day, cooler air will start to filter in with a stronger Southwest flow bumping up the ridgetop winds. We could see clearing skies, but again some clouds and a snow flurry here and there should be expected.